Let’s face it: The world of sports evokes lots of emotion. That’s partially why we love sports so much. 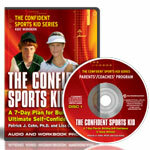 But as sports parents, your emotional state affects your kids’ confidence in sports. In fact, if you can’t keep your feelings under control, your athletes might not thrive in sports. That’s the word from Anthony Ross, a sport psychologist, former All-American tennis player and director of SportParentSupport.com, who conducted research at the University of Queensland into how sports parents influence their kids’ development and well-being in sports–and life. Ross’s research looked at what sports parents can do to foster well-being in their young athletes. He worked with 60 kids and parents, and asked the parents to watch a 40-minute video and read a booklet explaining how to be better sports parents. A month later, the kids of these parents reported that their confidence and self-esteem had improved, he says. “The main thing that came out of this research: Parents should communicate unconditional love and empathy and focus on kids’ strengths,” says Ross. Perhaps what was most interesting–and likely most controversial to you sports parents–as what Ross learned about sports parents who can’t keep their emotions under control. Using research about how the brain interprets emotions, Ross found that parents who can’t keep their feelings under control have a hard time applying tips about how to improve their sports parenting skills. Why? This is the controversial part–the part that you may or may not agree with. Ross found that sports triggers emotional experiences from these sports parents’ childhoods–and the parents are generally unaware that this is happening to them. Then, years later, when this parent saw his child perform badly, it would evoke the same sense of shame about performing badly. “The parent may not want kids to feel that, or might become angry, and will do their best so the child performs better.” That often translates to yelling during games and pressuring kids. Ross’s suggestion to these emotional-in-sports parents is to reflect on their childhoods and try to understand what pushes their buttons–and then try to change their behavior in youth sports. Ross’s ideas about emotional sports parents are fascinating and certainly something for sports parents to consider. Here at Kids’ Sports Psychology, we agree with his first conclusion: That sports parents need to communicate love and empathy and focus on what kids do well. If parents focus too much on negatives, kids will, too. That can cause them to embrace negative self-talk, focus more on avoiding mistakes, and stop taking risks—all mental game no-nos! Confidence Video Tip 8: Confidence is a Long-Term Project, a video. What are folks saying about our resources? Improve your sports parenting skills and help your young athletes make the most of their sports experience! Reading this I immediately thought that parents who show negative emotions on the field had in some way had negative experiences when they were playing sports. You see it quite often on the field; parents who want to relive their glory days through their children. Although I do not completely agree that showing kids unconditional love when they make a bad play or mistake, I do think that after the game/match the child needs to know that they did their best and that their parents are proud of them. I think that kids these days are coddled a little too much, but I also don’t believe in ripping one’s kid or someone else’s for that matter in front of the entire team. Parents do need to learn how to cope when attending youth and HS sports games of the kids, but what if they don’t feel they have a problem? How do you deal with that as an outsider or a peer? I would think that by continuing this behavior the kids will be put-off from sports and no longer see the fun in it if their parents continue to yell and display negative emotions. In the long term this will only be hurting the kids. If you see parents behaving in ways that you think might hurt their sports kids, you should gently and politely suggest to them that they might be hurting their kids’ experience in sports. You will be doing everyone a favor–the parents and the kids. You could direct them to this blog and to our interview, saying something like, “You might want to check out the Youth Sports Psychology blog at the Ultimate Sports Parent and see what some of the experts say about parents and youth sports.” You could also mention that 75% of kids drop out of sports by the time they are 13 because they’re not having fun anymore. Another option would be to share this blog and interview–or other similar resources–with the coaches, and let them share it with parents. You’re right, in the long term, yelling and being negative only hurts the kids.